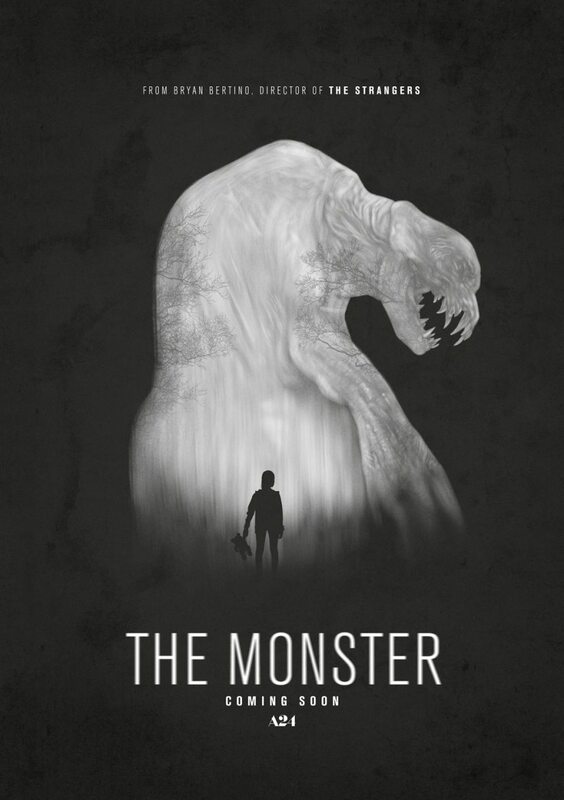 The Monster (2016) is a new horror movie from director Bryan Bertino, the talent who helmed one of my favorite horror movies of the past decade: The Strangers (2008). Bertino also directed an underrated and highly disturbing found footage horror film from 2014, Mockingbird. Bertino’s new genre film is something a bit different. Basically, The Monster plays like a modern day The Twilight Zone (1959-1964) episode. It involves basically two characters in one location, a wooded road at night-time, and an element of the supernatural. In this case, that supernatural element is a ferocious -- and very hungry -- creature. The Twilight Zone also told very human stories, and The Monster is like the Serling series in that regard as well. 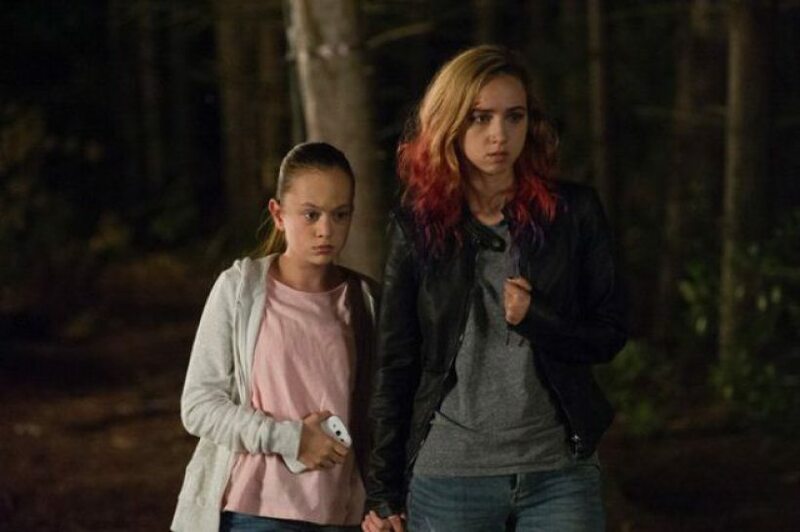 Here, an estranged mother, Kathy (Zoe Kazan) and daughter, Lizzy (Ella Ballantine) grapple not only with the monster that threatens their existence, but the one that has gotten between them -- alcoholism -- and threatens their lives in a different way. There are no elaborate special effects in the film, and the monster itself looks less impressive the more often it appears on screen. And yet the movie casts a spell. The Monster is a slow-burn type horror film, and one in which audiences will increasingly invest in the main characters and their dilemma. Many of the moments that mother and daughter share are absolutely heart-breaking. The film only goes off track, a little, in the last act. There, one character’s actions are baffling, and more than that, even useless. The end needed a rewrite to make a final act more meaningful in the overall scheme of things. In other words, the movie doesn’t precisely have to end on the down-note that it does. Some people might judge the film, therefore, as overly manipulative. 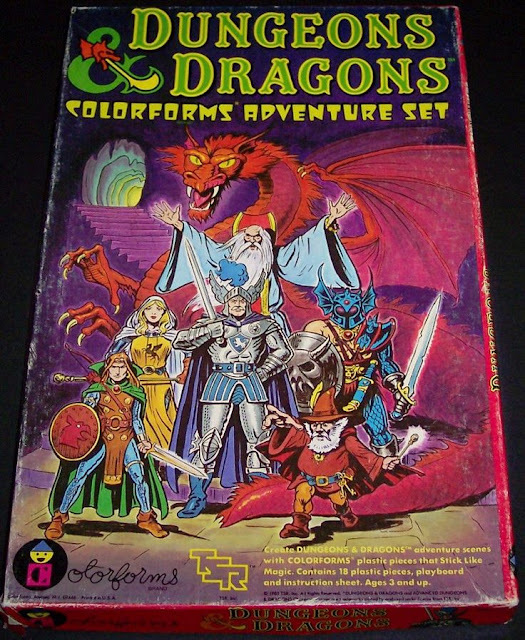 Despite such a misstep, The Monster moves with absolute confidence and with a total mastery of our emotional states. The film is tense and upsetting. It’s the story of two people who have taken a wrong turn in life, and then take a second (and monstrous) wrong turn that, in a way, restores the balance of their relationship. The Monster is a horror movie on a small, contained scale, and yet by keeping the approach intimate, Bertino masters his material thoroughly. Rod Serling would have been proud. Young Lizzy (Ballentine) cleans up the family apartment after her mother has had another all-night bender smoking and drinking. She attempts to wake her mother, Kathy (Zoe), because they are supposed to drive to see Lizzy’s father that day. But Kathy won’t be roused, and sleeps all day. They start out on the trip late, and soon night falls. On a long, dark, deserted road, Kathy and Lizzy reckon with the crack-up of their relationship, at the same time that it rains heavily. There is an accident on the road, and it appears that Kathy and Lizzy’s car has struck a wolf. But when the wolf carcass is examined, a strange fang is pulled from its wounds. The fang looks like it belongs to no known animal. After Kathy and Lizzy call 911, a tow truck arrives to pull their damaged vehicle to safety. But the dark, strange animal that killed the wolf is still nearby, and attacks the driver, Jesse (Aaron Douglas). Kathy attempts to encourage Lizzy not to be frightened, but the monster intensifies its attacks. After an ambulance arrives, there is another vicious attack, and Kathy realize she is finally going to have to be the mother she has always needed to be, if her daughter is to survive the night. There is hope and sadness aplenty in The Monster, a film that concerns the wreckage of a mother-daughter relationship. A monster has already taken one of them away, in a sense, when the movie starts. In particular, Kathy is an alcoholic, and we see in brief flashbacks how she is unable to resist or escape the bottle. Lizzy and Kathy fight with one another, and shout with another, and it’s all because Kathy can’t escape from her addiction to become the person that Liz needs her to be. In a fashion worthy of The Twilight Zone, Kathy is called to overcome one monster so as to face another one, and live-up to her role as parent to Liz. One of the key strengths of The Monster involves the two lead performances, and the development of the characters. Kathy and Liz are both sympathetic and unsympathetic at points, and clearly hoping to “save” their relationship, even if they don’t know how. Liz has been forced to grow up ahead of her time, and the early, dialogue-less first scenes of the movie chart this fact in a memorable montage. In particular, Liz cleans up her Mom’s apartment alone, going through the wreckage or detritus of her life, as Kathy sleeps it off. On the soundtrack, a country song (“A World So Full of Love”) plays, and the juxtaposition of the lyrics and Liz’s actions is haunting. The images and song speak of a world in which love is crucially important, and yet, on its own not enough to solve problems, or end suffering. Kathy loves her daughter, but is a lost soul. We don’t know what it is inside her that makes her susceptible to the demon of alcoholism, but that demon possesses her. There is a brief scene in the film wherein Kathy sits on her apartment porch and tries to resist drinking. She can’t. She goes dumpster diving instead. In one of the film’s most emotional moments, her daughter finds her passed out next to the toilet. Her daughter holds her in her moment of vulnerability. The roles have been reversed. The one who needs care is, instead, providing it. So little Kathy is tired of being the “Mom,” and Liz wants to be a good “Mom.” The strange events on the dark road, in the middle of nowhere, allow these two women to re-establish their roles as mother and daughter in a powerful way. Kathy rallies, and Liz allows herself to be cared, and loved. My big concern with the movie is simply that I don’t think that the ending is entirely justified. Spoilers ahead, so watch out. But basically, I don’t believe a sacrifice is called for, given how things play out. I think that with a little more planning, the mother and daughter roles could have been re-established without one person in the relationship giving up everything for the other. When one looks at how the monster is fought, and defeated, the preceding sacrifice is unnecessary. It is, however, emotional. The Monster succeeds on the basis of its limited location and characters. It depicts a story that feels “true” to the characters as they are presented, and doesn’t find it necessary to include a lot of extraneous bells and whistles. The monster costume itself isn’t great, though it gets a great opening shot (blurry, in the background, unnoticed). Finally, as I've noted the ending isn’t everything I hoped it would be. But again, I thought back to The Twilight Zone. Special effects weren't the point. Rather, the stories were about the human condition. And The Monster is, ironically, the most human of recent horror movies. Approach it on those terms, and you may find it affecting and memorable. John, interesting review. I always appreciate a horror film that is small scale[one location, few cast members...], but scary.